BISHKEK, Sept. 8 (Xinhua) -- Kyrgyz President Sooronbai Jeenbekov met with visiting Vice Chairman of China's Central Military Commission Xu Qiliang here on Friday, pledging to strengthen cooperation with China in defense and security. Kyrgyzstan attaches great importance to bilateral defense and security cooperation and is ready to work with China to prevent and combat the "three forces" of terrorism, separatism and extremism, which will contribute to regional peace and security, Jeenbekov said. Xu, who is also a member of the Political Bureau of the Central Committee of the Communist Party of China, said the two countries have expanded their military exchanges, enriched cooperation, and improved their military mutual trust, adding that the cooperation has been fruitful within the framework of the Shanghai Cooperation Organization and has played an important role in safeguarding security and stability of the two countries and even Central Asia. He said China is ready to work with Kyrgyzstan to implement the consensus reached by the two countries' heads of state and to inject new vitality into the development of a comprehensive strategic partnership. The Kyrgyz president said Kyrgyzstan firmly supports the Belt and Road Initiative (BRI). The ancient Silk Road and BRI have created a close bond between the two peoples and in recent years, bilateral relations in such fields as politics, economy and culture have developed in an all-round way, Xu said. 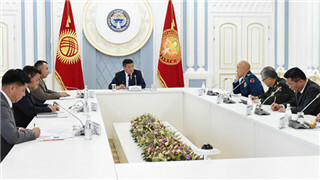 During his visit, Xu also met with the Chief of the General Staff of the Armed Forces of Kyrgyzstan, Rayimberdi Duishenbiev.